Here’s My Story: Where is Daddy? 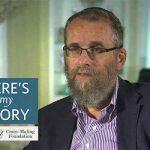 Reb Yisrael was a special person, a very deep and caring person, and coming out of my father’s room, he saw that my brother looked depressed. So, in trying to give my brother courage for what lay ahead, he told him this story. “Do you know your father was not well when he was young?” Reb Yisrael asked my brother. My brother said he knew about it but it happened before he was born. My grandparents asked Reb Yisrael for his opinion. 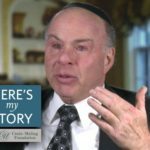 “Who am I to answer such a question?” he replied, suggesting that this was a matter for a top leader in the Jewish world. And he offered to send a letter on their behalf to every major rabbinic figure at the time. He ended up sending out twenty-three letters, explaining the situation and asking if they should go ahead with the operation or not. He sent out so many letters because he was not sure who might reply. 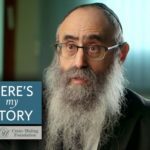 After the war, there was so much sadness and so many questions of loss and heartache that the rabbis were constantly having to deal with. But he did receive one reply. The only one who responded was the Lubavitcher Rebbe. The Rebbe wrote that his heart pained him to hear about such suffering, but that he felt unable to answer the question. However, he wanted to put forward a suggestion he had heard from his father-in-law, the Previous Rebbe, that a person who studies Chitas daily will see salvation. What is Chitas? It is an acronym for Chumash (the Five Books of Moses) Tehillim (the Book of Psalms) and Tanya (the seminal work by the Alter Rebbe, the founder of the Chabad movement). The Rebbe was recommending that my father begin studying portions of these holy books every day according to a set schedule. “If that’s the case, the Rebbe recommends that a friend do it,” he was told. Although he was not a Lubavitcher, Reb Yisrael followed the directive of the Lubavitcher Rebbe and became that friend who studied Chitas for my father. This is what he told my brother. After six weeks, my father showed marked improvement, and the doctors began to speak about releasing him from the hospital. And after another six weeks, they did release him. When that happened, my father followed the advice of Rabbi Moshe Schwab of the Gateshead Talmudical College , who told him to change his place of residence as per the dictum, “Meshaneh makom meshaneh mazel – A change of place can change one’s fortune.” This is why we moved to Gateshead when I was five. 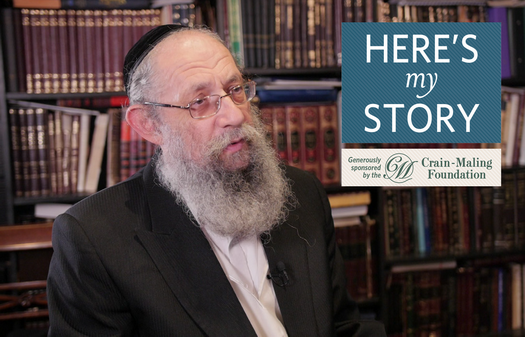 From that point on, until he reached old age, my father was fine – he held down a job, provided for our family and was actively involved in the local Jewish community. I found this story to be very powerful because it goes to show that we don’t know through which spiritual channel we are being sustained. And it also made me think about all that the Rebbe did for us all and still is doing for us today. I hope this story goes on to inspire everybody who reads it. Mr. Aharon Denderowitz resides with his family in London, England, where he works as a primary school teacher. He was interviewed in June of 2018. Thank you for printing this wonderful story!